The colour red symbolises love and firey passion and what better way to express those feelings than with 12 Colombian long stem red roses? Add a wee bear for an innocent touch of adorable cuteness and you have a winning combination. Our ruby red, premium red roses have a long 50cm stem and arrive nestled inside a stylish presentation rose box. Accompanied by `Mr Bear`, this beautifully packaged gift is guaranteed to put a rosy blush on the cheeks of your other half this Valentine`s Day. 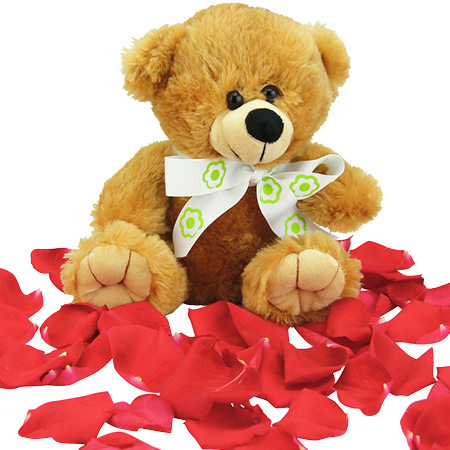 Order your 12 red roses and teddy bear now and earn a few brownie points in the love department! PS. `Mr Bear` is 20cm and has short, soft brown fur. He is rather handsome. Please Note: Due to delivery volume on Valentine`s Day, no changes to orders can be made after 18:00 AEST Thursday 7th February for Thursday 14th deliveries. It is also important to note we are unable to guarantee delivery times on Valentine`s Day - roses will be delivered anytime between 7 - 5.00pm (business addresses) and 7 - 7pm (residential addresses). No re-directs will be possible if the recipient has left the delivery address for the day, however we will try, where at all possible, to accommodate your needs if this situation does arise. We thank you for your understanding! 2019-02-20 Service rating : Flowers are fresh and arranged perfectly. Delivery date was spot on. Thank you.